Internal Communications: Seven Apps That Work There are lots of cost-effective, easy-to-use apps that can boost employee engagement and improve team communications and collaboration overall. Here’s our pick on seven apps to drive internal communications success. Internal communications usually depend upon the more traditional channels of email, intranets and team briefings, but today’s employees expect more. There are lots of cost-effective, easy-to-use apps that can boost employee engagement and improve team communications and collaboration overall. Here’s our pick on seven apps to drive internal communications success. Since it was launched in 2013, Slack has gained worldwide popularity as a free, easy-to-use collaboration tool. It brings a lot of communication functions together in one place including real-time messaging, voice and video calls and more. It’s cloud storage allows document uploads and transfers as well as archiving everything to be easily searched in the future. Slack channels allow focused discussion, and the platform permits tagging and integrates with many third-party services such as Github, Trello and Dropbox, among others. Organizations can upgrade to various paid versions to gain access to larger channels, or additional features. SocialChorus is an internal communications mobile app. Available for IOS or Android, this customizable, branded app provides communicators with useful analytics on engagement and content resonance and integrates with other employee engagement platforms such as Slack, Microsoft Office and MailChimp. Much like other popular social media apps, users get notifications when new content, polls or updates are available. Employees can read, respond or share content with each other or through their own personal social networks. SocialChorus is a good employee communications tool for any organization with a spread-out workforce. Organizations using Microsoft Outlook e-mail for internal communications should consider adding on PoliteMail for mass distribution. This add-on tool essentially combines all the features of MailChimp within Outlook giving organizations the ability to send newsletters and track metrics all in one program. Open and click-through rates, time spent reading communications, and attention rates can help IC professionals adjust communications to increase open/read rates. PoliteMail provides easy-to-use templates for creating newsletters within Outlook, along with tips on formatting and content to improve employee communications effectiveness. As a web-based intranet, Igloo is a fully-customizable internal communication platform that combines document management and collaboration tools with social software capabilities. It has a range of features such as file sharing, social newsfeeds, tasks, team calendars, and blogs. Igloo fully integrates with Box, Dropbox, Office 365, G Suite, Salesforce, and Zendesk. Unlike some intranets, Igloo is interactive, customizable, adaptive and accessible from the workplace or home via PC or mobile). It’s also cost-effective…it’s available for free for up to 10 users. Gamification comes to internal communications! PostBeyond is designed to support employee social media ambassadors. It distributes stories and content that is sanctioned for use on social media and encourages employee participation with a cool incentive program. Content is displayed in a tiled Pinterest’esq dashboard in which employees can search, pin and share to earn more points. The more engagement, the more points earned. Though still in beta, Facebook at Work is an employee engagment platform that mimics the features and functions of Facebook, but in a closed environment that is accessible only to company employees. Available online or as a mobile app, employees’ newsfeeds look and feel just like their personal ones but include company information, updates from colleagues, departments or teams. It includes Facebook’s popular groups and messenger features including audio, video, and emojis. Available to Microsoft 365 subscribers, the Teams app integrates internal communication into its the workplace bundle at no extra cost. As an encrypted, cloud-based chat workspace, Teams provides a safe channel for employees to receive information and communicate with colleagues. Teams looks and feels a lot like Slack and has many of the same capabilities. 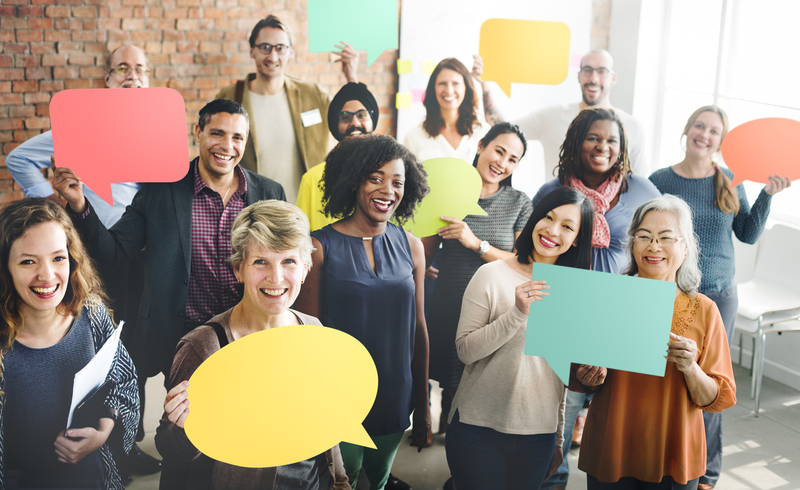 This is just a sampling of the many tools and platforms available to increase the effectiveness of employee communications and promote employee engagement and some user training is required for each to get the whole team involved and active. Is your internal communications plan built to maximise employee engagement? Find out with this free, quick online quiz. In my office we rely on Brosix. It is a business instant messenger and is extremely useful when you work with delicate information. It works perfectly fine, there have never been any complaints. Very secured and with many other features to help you finish projects on time. So many tools Kevin, and more every day. Thanks for the heads up on Brosix.